The Israel Forum for International Humanitarian Aid (IsraAID) announced on Wednesday that it will send send a team to Haiti, despite the current cholera outbreak. 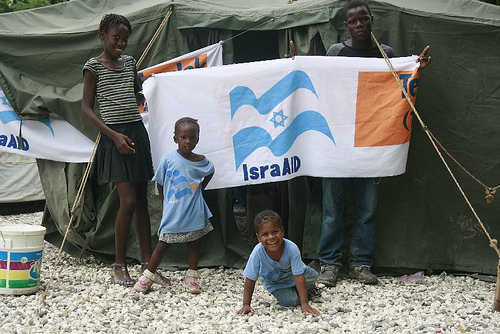 The team will leave Israel on Thursday to assess the progress of IsraAID’s programs in Haiti, as well as present its work in an exhibit using the IDF hopsital tent in the upcoming Jewish Federation General Assembly in New Orleans. They will also aid those affected by the cholera outbreak. More than 420 new cholera cases were confirmed Tuesday, according to the U.N. Office for the Coordination of Humanitarian Affairs. Twenty-five new deaths were confirmed, bringing the total to 284. IsraAID has been in Haiti since January 16, four days after the island was hit by an earthquake. The organization has provided including emergency emergency medical treatment, primary family medical care, medical rehabilitation, informal education, food production, and other services. Read rest of story, here. What will write Seth Freedman in the Guardian about ISRAID? Will Baroness Jenny Tonge demand an independent international investigation? This is wonderful news. However something tells me that at the last minute the Haitians will find an excuse for not wanting IsraAID’s help. I wouldn’t be surprised that at this very minute, people like Jenny Tonge, Guardian journalists, Amnesty International, Oxfam, Christian Aid and other plethora of anti-Jewish NGOs and international charities will be putting tremendous pressure on Haitian government to deny help from Israel. They’re probably saying its either them or us. There is no trick these progressive anti-Jews will not pull in order to sully Israel’s name. I hope I am wrong and that Haitians get all the support they need, not just from Israel but also from other decent NGOs around the world. The Haitians will accept the Israelis. THey love the Israelis and word on the ground there, is the Israelis were the most adept at search and rescue as well as the medical care. I am traveling for my third time since the quake to help out medically. Anti-semitism has not (thankfully) reached Haiti. ANd the Jews and Israelis there do not hate themselves.